Age Discrimination – Sometimes it’s OK! An American friend of mine once commented that they would never have a sign like this one in his country! He said it was patronising. Let’s face it, he’s probably right! 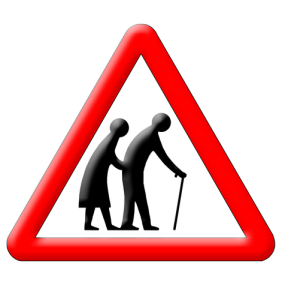 The image of old people as hunch-backs with a walking stick isn’t particularly dignifying. I suspect that one day, the sign will be abolished! So what’s this got to do with employment law?! Well, as an employer, you know (or ought to know!) that you can’t treat someone less favourably just because of their age. That’s age discrimination. But you may be surprised to know that sometimes it’s OK! In certain circumstances, your business may be able to justify treating employees differently because of their age. Here are 7 of the most common exceptions to the age discrimination rule. However, if the benefit is affected by length of service of over five years, you will need to be able to show that it fulfils a business need, such as encouraging loyalty. The minimum wage varies depending on how old the employee is. The minimum redundancy payment the law requires you to pay is potentially discriminatory as it is calculated based on age or length of service. If you have an enhanced redundancy scheme that is calculated along similar lines, this will not be regarded as discriminatory. Your business is entitled to provide employees with access to insurance or a related financial service up to the age of 65. There is no longer a default retirement age allowing you to automatically retire all employees when they reach age 65. Although your business can still have a retirement age that applies to all employees, you will need to be able to show that the compulsory retirement of an employee achieves a legitimate aim. Promoting access to employment for younger people. Efficient planning of the departure and recruitment of staff. Sharing employment opportunities fairly between the generations. In some (rare) circumstances, your business can stipulate that, because of the nature of the job in question, only people in a particular age group can do the job. An obvious example is that it could be considered necessary for those in the fire service to be younger than a certain age so as to be able to perform physically demanding tasks such as fire-fighting and rescue. Your business can take positive action if you think any of your employees are disadvantaged or under-represented because of their age. For example, if the majority of your employees are under the age of 40, you could place a job advert encouraging applications from all age groups, especially applicants over the age of 40. This is risky though and could land you in a Tribunal if you don’t get it right! If you need help managing your staff and avoiding the pitfalls, why not give me a call on o1604 619 810 for a free chat about our services.